Author(s): Panda Madhulita, Patro Ganesh, Malpani Amol, Majji Sunil, Rao Bhanoji M. E.
Author(s): Smriti Muralidhar, Shashidhara S, Rajasekharan P. E, Hanumantharaju N, Rajendra C.E. 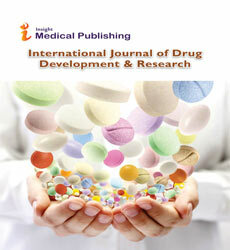 Author(s): Deshmukh Narendra V., Doijad Rajendra C., Bhambere Deepak S, Somapur C and Goje Arjun, Patel Kareeshma S.
Author(s): Eze Uchenna IH, Odunayo Oluwakemi O. Author(s): Shinde Anilkumar J., Paithane Manoj B., More Harinath. N.
HPTLC Determination of Phenolic Compounds and Antioxidant Activity of the Aerial Parts of Melothria heterophylla (Lour.) Cogn. EFFECT OF CASSIA AURICULATA SEED EXTRACTS ON BLOOD GLUCOSE AND LIPIDS IN WISTAR RATS. Author(s): Dama G.Y., Tare H.L., Gore M.S., Shende V.S., Deore S.R., Bidkar J.S., Gorde P.V.